Oil Color: It’s somewhere between the color of walnut and mahogany wood. ITI: Blood musk diluted in a chypre laden with oak moss surrounded by the bright floral of the tuberose that almost skews into the realm of a white floral. Oppoponax swirls just under, earthy and aromatic. It’s interesting. It does remind me of blood coursing through the body, yet the tuberose adds something that does strike me as strangely hollow as well. Wet: The tuberose emerges as the top note upon immediately application, clear and declarative, followed by the blood red musk, which has taken on a more spicy tone next to the oak-moss chypre. Just under, I can detect shocks of oppoponax and very subtle beeswax, which warms the scent slightly. Dry: After 4 hours, I’m only getting tuberose with hints of chypre and oak moss, gently warmed by a sliver of red musk. It’s nice, but I wish some of the besswax and ambergris were more discernible throughout. Scent Description and Notes: “Never afraid to stand out in a crowd, Juicy Couture captures the cheeky boldness of a girl who marches to the beat of her own drum. 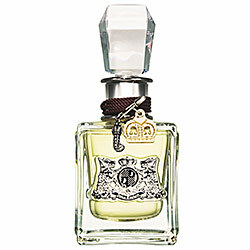 Juicy Couture smells like Couture with a blend of water hyacinth, princess lily, and sweet caramel. Pam and Gela wanted every girl to have her own Juicy Couture, so they made a fabulous line of fragrance essentials adorned as only Juicy Couture can—some with charms and trinkets, and all in the most beautiful bottles and jars you’ve ever seen. Bottle Design and Artwork: This is a standard 1.5ml sample vial. The vial is a clear plastic with black writing featuring only the brand/scent name in block text. ITV: Toothpaste, alcohol, and florals. It’s an odd combination, honestly. Wet: Lily, something that reads as toothpaste still, apple, tuberose, a hint of mandarin, and hyacinth come through on my skin. As it starts to dry, it takes on a powdery quality. Dry: It gets very powdery on me along with slightly fruity and faintly floral. Beyond that, the scent doesn’t really last for very long.